Happy Halloween from the gang at FontShop San Francisco! Raising the dead tonight? How about a blog post from 2008 instead? Check out “Scary Type” from the Font Feed. Here’s some Fontlists for the occasion. Check out Scary Type: Cartoons; Distressed; Twilight Fonts; Sketched, Scratched, Scribbled and our Pirate Fonts lists for inspiration. Did you have a type-related costume? Tell us in the comments. TYPO comes to SF in 2012 and we reflect on London 2011. Our San Francisco crew picks some of their favorites for the month. Use promo code ISTD11 to save 10% off FF Dagny, FF Milo Serif and FF Spinoza, which recently received certificates of excellence from the International Society of Type Designers. Hurry! Discount ends October 31. Theresa’s Tips covers licensing this week and how it varies based on platform. Join the conversation on Facebook and Twitter and let us know if you’re dressing as a typeface for Halloween. Earlier this week we made the exciting announcement that TYPO, Europe’s most successful design conference, will be coming to San Francisco. With the week winding down, two of our SF staffers reflect on the TYPO London conference held last weekend. TYPO London felt just like past TYPO Berlin conferences. The speakers had great stories to tell, compelling experiences and ideas, and their presentations were impeccably designed. I loved seeing attendees and speakers mingle outside the auditorium during breaks. My favorite presentation was from Kutlu Çanlıoğlu on how the BBC accommodates a huge number of language on their many sites. And the most exciting moment was receiving an autograph from King Bansah. This was my first TYPO and I’m so excited that we’ll get to experience this in the states next year. I’ve never been so creatively inspired in an auditorium before, by such a diverse group of speakers. The mix of students and design notaries created a most amazing vibe. I loved seeing the inspiring women who presented and their use of color and storytelling in design. Of particular note to me were Nat Hunter, Marina Willer and Morag Myerscough. And let’s not forget the killer sketch notes of Eva Lotta-Lamm! You can find more wrap-up of TYPO London on their blog. Did you attend the conference? What were some of your favorite moments? Who would you love to hear from in San Francisco? We’ve passed some bits around the office; shuffled some emails. Here are our staff picks for October. David picks Leitura Sans by Dino dos Santos of DSType. “Here’s a grotesque that plays on the edge between the American gothic and the European grotesque conventions. To me it comes off as refined and beautiful, set both large and small.” The Leitura Super Family claims Leitura Sans. Anna picks Katarine by Tomas Brousil from Suitcase. If you’re starting your project, you’ll want to think about where you will want your typeface to live. Do you want to create mobile applications for the iPhone? Will you need to spruce up your website? Are you creating marketing materials or graphics for a product? So many questions, but hopefully I can help you sort out the type of license you’ll need with this brief overview of what FontShop offers. When viewing our site you’ll see three types of licenses: Desktop, Web, and Mobile. A desktop license allows a font to live on your computer. The software is installed on your system so that you can use that font in various programs, such as MS Office or Adobe Creative Suite. Most desktops licenses do not allow you to include the font software on your website or mobile app, so additional licenses are needed. Web licenses allow your fonts to live on your website using the CSS @font-face rule. Fonts that are made for the web can be in different formats, with the most common being WOFF. You can view all webfonts available here. Mobile licenses are the latest addition and will allow a developer to include fonts into an app. The best part of a mobile license is that once the developers are licensed, they are not limited to the number of apps they can create and the license is perpetual, just like web and desktop licenses. Also, Mobile Fonts have web and desktop counter parts. TYPO, Europe’s premier design conference, will hit American shores next year with an event in San Francisco. More information will be coming soon, but we wanted to confirm the exciting news announced at the close of the successful TYPO London conference this past Saturday. Will we see you in SF? Can’t make it to Typo London? Don’t fret! Follow @typoconf and #typo11 via Twitter to get updates from the conference. There are also two live streams scheduled for each day. With the introduction of Mobile FontFonts, you can now move your online brand to mobile. Read the latest newsletter to find out who won and then visit our new foundry, psType. Have you been following Theresa’s Tips? If not, then here’s your chance to catch up! Read it here. Yves Peters covers “French Advertising Alphabets from 1946“. It’s time to highlight and link to all the previous tips, so if you haven’t been following them then here’s what you’ve missed. We started with brief introduction to the formats that FontShop offers then delved into three features of the site: History, Favorites, and the Shopping Cart. We kept the ball rolling with an overview of the tabs you see on a product page that allow you to view specimens and even similar typefaces. There is even a way to see if the typeface you want to license supports a specific language. And if you’ve been following my tips you should now know where to find licenses, get an overview of your shopping cart, and obtain a quote. One more thing, the My Account section is another area that is overlooked, so we covered that as well. Why? Because FontShop stores all your account information here and if you wanted to change a password, view your license agreement, or download your fonts again then you can. We also have a Help Desk, where we go over common questions customers have asked us in the past. Now you’re up to date with all the previous post. Last week we introduced Mobile FontFonts, 15 type designs in 14 font packages for embedding in apps, tailored to the needs of iOS developers. Did you know that all the faces we put out as mobile fonts are also available as webfonts? That means that you can design your mobile apps to reflect the brand you’ve created on your website, or that you can give your site a familiar feel to those who know you through your app. So go on, get with it. We can’t wait to see what you think up next. FontShop International introduced Mobile FontFonts for iOS Apps. 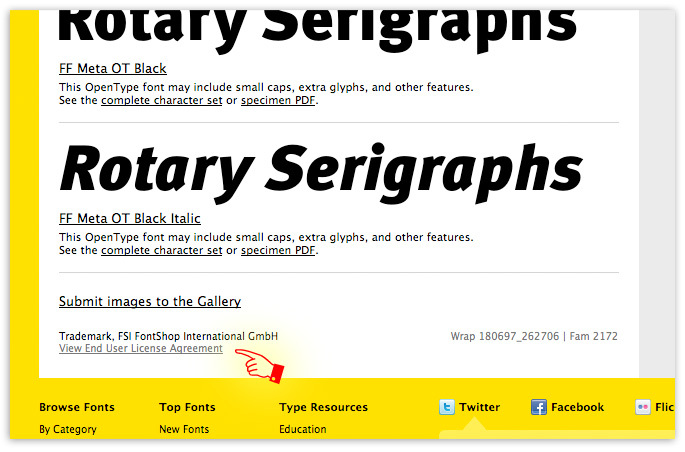 Check them out at MobileFontFonts.com, then bookmark the Mobile Fonts list on FontShop. David Sudweeks recaps the fonts joining our library in September. Theresa’s Tips takes you through the steps of finding out if a typeface supports a specific language. Have you read about KernType? Try it out over the weekend and tweet @FontShop your score! September brought us plenty of new fonts to go through. We added two new foundries, Astype & Storm Type Foundry, and got several new releases from Filmotype, Newlyn, HvD Fonts, TypeTogether, IHOF, and a new subset of URW++’s collection called profonts. Here are a few selections from September’s New Fonts. Gerard Unger’s news types are some of the most legible and spatially economical types one can come across. Initially designed in 1998 for wayfinding signage and reworked for newsprint text this year, the face is strong and dignified in tight spaces. František Štorm refers to Monarchia as a transcription of Rudolf Koch’s Frühling. The original fraktur was designed from 1913–1917. Walbaum is also shown. When the brief calls for it, this three-volume set of Victorian flourishes makes easy the process of dressing a typographic composition in soft trimmings. Use restraint. The sample above is shown with Secca. Here’s a few tips to see if the typeface you want to license supports a specific language. Make sure you have a phrase or simple word in the characters you need in hand. For example, let’s find out if FF DIN Regular supports Cyrillic characters! The first step is to search for the typeface and then change the custom text to the characters you need supported. Right away we can see that only the PRO version of FF DIN Regular is rendering the text. From there you can go to the product page and check out the entire Character Set. Typically if a font supports additional languages you’ll see multiple pages that show all the glyphs. In this case, FF DIN Pro Regular has four pages and contains 887 Glyphs that you can view. Because I’m a triple check kinda of person, I want to go through the pages of the Character Set to make sure the glyphs I need are there. Done! Everything looks good and now I know that I can create documents in Cyrillic using FF DIN Pro Regular. FontShop International released 14 font packs tailored specifically for use in iOS apps today, once again leading the way in typographic technology. Available at MobileFontFonts.com, the files are optimized to make the design process for creating beautiful iOS applications as seamless as possible. Mobile FontFonts are optimized for screen and licensed for use on mobile devices. When designing a native app for a mobile device, like iPhone, Mobile FontFonts allow the designer to specify fonts outside the options that come preinstalled. Mobile FontFonts are presently supported in iOS only. Just like webfonts, mobile fonts protect brands and help set apps apart from the crowd. 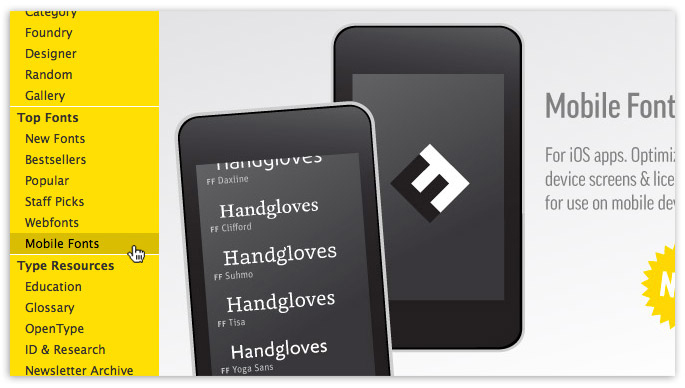 Optimized by hand for the device screen, Mobile FontFonts enhance the user experience. Mobile FontFonts let designers and developers break from the mold of system fonts and give their products some personality. With language support included, Mobile FontFonts allow for consistent, subtle branding to a global audience. 56 mobile fonts from 15 popular families are available in 14 packs with 4 fonts each. Licensing for Mobile FontFonts serves the needs of the iOS developer. A team of up to five developers can share one license for their app portfolio. There’s no time limit on the license, nor annual royalty requirements, just a one-time license fee. Mobile FontFonts are specifically formatted for embedding into an iOS app. No more hours spent converting fonts! Each is optimized for performance on screen and features developer-friendly licensing and pricing. For a limited time, FontShop offers a free download of FF Basic Gothic Mobile Pro Black Italic for developers to test in iOS apps. Although initially available only for use in iOS app development, mobile fonts for additional platforms will be released in the coming months. There are also plans to release additional font families, so designers can use typography to create truly 360-degree brands across desktop, web, and mobile. Our SF staff reflects on what Steve Jobs meant to them. David Sudweeks takes a look at some of the new additions to FontShop – Storm Type Foundry and Astype. 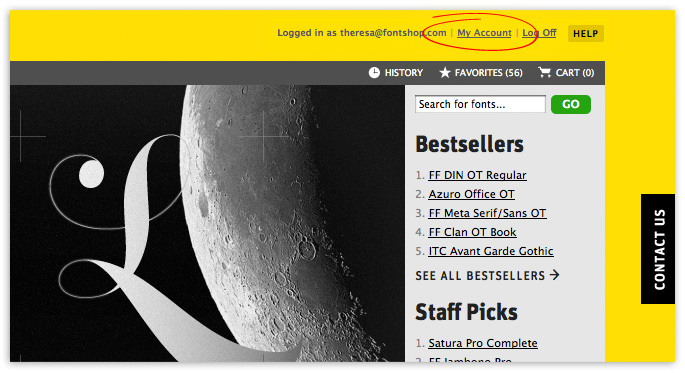 Theresa’s Tips this week reviews the “My Account” section on FontShop.com. The latest edition of My Type of Music hits the FontFeed, as well as a follow up. Yves’ two parter on numerals gets a nice mention on Daring Fireball. The design world lost a great visionary yesterday and many employees in our San Francisco office lost a personal hero. We wanted to share some of our personal memories with you today. We’ll take just a moment to look back briefly before we return, as Steve Jobs inspired us, to looking forward. I always opt for a window seat when I fly. I remember one flight I took when I was 13 the clouds were spectacular out my window during takeoff, but instead of watching them, I couldn’t take my eyes off a small device the gentleman in the seat next to me had in his hand. It was a newly-released 1st generation iPod Classic. I’ll never forget talking with him about it and thinking, “Wow… that is so, so cool. And not only that, it looks beautiful, too.” That was the start of my appreciation for Apple’s elegant, intuitive, (oftentimes invisible) design. From that point on Apple products began to slip into my life and into my work as a designer – and I’m thankful for it. The Steve Jobs approach to design and manufacture not only brought us the great products that he and his atelier produced, but upped the standards generally, and in so doing, changed everyone’s expectations and their relationship to computers, and ultimately to each other. Starting with the why, and then building the user experience—carefully planning from the end to the beginning and each step in between, and doing it consistently—is what separated Steve from everyone else in the industry. Jacob Swartz, Front-End Developer, shared the video below of Jobs’ 2005 Stanford commencement speech. Around 3:23, Jobs touches upon typography and its way into computers. My childhood coincided perfectly with the dawn of the personal computing era. My first computer was an Osborne 1. My first modem ran at 300 baud. My first hard drive came in a Northstar Horizon, and my first social networks were BBSes, FidoNet and Usenet. I can remember riding my BMX bike to local computer stores to drool over and demo early Macintosh, Amiga and Atari ST models. My first Steve Jobs machine was a NeXT cube, with the titanium case. Truth be told, it was neither more beautiful nor better than the Sun Microsystem and Silicon Graphics machines I also worked on. I came to Apple products late in the game. I knew who Steve Jobs was, followed his story, but didn’t buy his products. My first Apple purchase was an iPhone 3G. It replaced the horrid Nokia E61, a machine I had wanted so badly that I wandered the electronic stalls of Singapore in hopes of scoring an early model. My son is growing up in a world where any question, asked at almost any moment, can be answered instantaneously. This is profoundly different than my childhood. This is very different than even 5 years ago. Steve Jobs was there at the dawn of personal computing, and he became even more inventive and surprising as he grew older. He left our world at the peak of his powers, long after the other geniuses of his era stopped shaping our world. Without Steve Jobs and his vision of mobile computing, our present Internet life would have been in the hands of Nokia and RIM and Blackberry and the early Android initiative. Think back to what those last models looked like before the first iPhone was released. And even now, in death, Steve Jobs has probably delivered another first in my son’s life: the first computer he will speak to regularly. I can’t wait to see what questions he asks. I remember being about 2 years old and my parents started allowing me on the Mac SE we had; I was so fascinated with MacDraw! Even if I could only use black and white, it was a much better (and neater) solution for my parents than letting me dip my hands in paint or draw on the walls in permanent marker (which I did anyway). Not only did Steve Jobs innovate, but he encouraged and empowered us all to be innovators ourselves. Through intuitive products that even a kid in the pre-internet era could figure out, he’s shaped the communicator I am today. One of my earliest childhood memories was writing a computer game on our Apple IIE with my dad. He’d been using a Macintosh Plus while back in school for engineering, but the IIE was our family machine. Little nerd that I was, I spotted a programming for kids book at the library and Dad and Idecided to make a go of it so both of us could learn. We both figured out that coding wasn’t for us, but the joy of using the computer to tell a story and communicate interactively stuck. I soon figured out how to do this using Print Shop. I exhausted our dot matrix printer by creating cards and banners for everything. I demanded the companion for Christmas so I could have access to more fonts. I used the different type and graphic combos to craft stories and exercise my creativity. I’m so glad my parents encouraged this at home, as it helped me excel when I got to use the shiny new Apple and later Mac products at school. Educational games so easily playable on the IIE and then the GS helped me absorb a ridiculous amount of trivia, as well as sparked curiosity about the world and learning. I rediscovered my love for Macs in the communications programs I enrolled in at college and spent a summer working with one of my professors teaching a new generation of kids how to tell stories via the first edition of iMovie. When I graduated my parents offered to gift me a downpayment on a car or an iBook. Guess which I chose? As an adult, Apple products have dominated the story of my life. My dream of giving a soundtrack to my daily activities has been achieved through the iPod/iTunes. The app revolution helped me completely reshape my outlook on health and fitness, by making managing my activities fun and intuitive. My iPhone has allowed me to personally and professionally communicate from relaxing in my pajamas on a rainy morning, riding a bus in Milwaukee or huddling outside a Starbucks in Europe. My parents and I no longer code together or print silly cards for one another, but we communicate daily on our MacBooks, iPhones or iPads. Our family is not so much one of techies, but storytellers. Empowered to easily tell tales both written and visual, our creativity continues to be stirred thanks to the vision set only just before my life began. Many things bring happiness to my life. Two of them are Apple and Star Trek. When I watch Star Trek, I wish I was there. Through the years as I’ve used so many Apple computers and devices, I’m always one step closer. And with everything that Apple has achieved through the years, now everyone benefits more and more with the functional beauty they created and the innovation they inspire every day. I started as an intern at FontShop in June 2007, the same time the first iPhone was release. A few FontShoppers bought the magical device when it came out and I remember gathering around their desk to watch them unwrap it. Everything was looked at, down to the packaging, and it was crazy wonderful.